Loaded with crab pots, the fishing boats docked in Conche Harbour in Newfoundland, Canada wait patiently to begin their daily life. 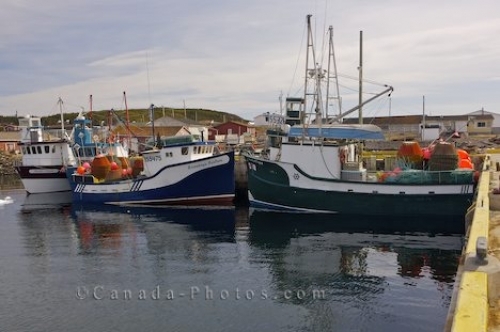 The fishing boats in the harbour of Conche in Newfoundland, Canada are all fully loaded with crab pots and ready for departure once the harbour is free of pack ice which lingers for a while in late Spring and early Summer. While the harbour is blocked, the fishermen give their crab fishing boats a thorough rundown to ensure that everything is working right and all the fishing equipment needed is loaded on board. Crab Fishing boats 'Bromley's Venture' and Conche Flyer in Conche Harbour unable to leave the dock because of pack ice, Conche, French Shore, Northern Peninsula, Great Northern Peninsula, Viking Trail, Newfoundland, Canada. Picture of the crab fishing boats fully loaded with crab pots in Conche Harbour in Newfoundland, Canada.